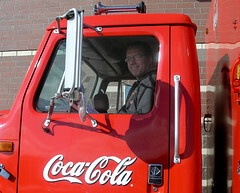 Wednesday morning at the Minnetonka SuperTarget: A hard working Coca-Cola employee delivers the goods. I drink Diet Coke, and I prefer those little glass bottles. Available in 6 packs. 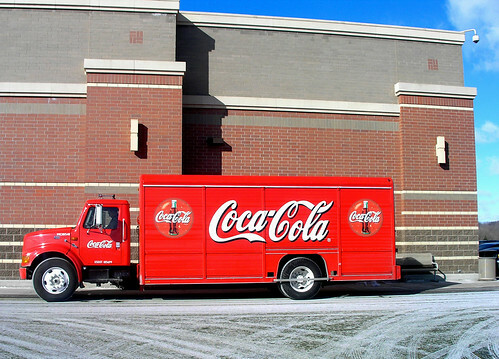 All trace elements of cocaine were removed from production of Coca-Cola during the 1890s. My source: The book "The History of Soda Pop". I had just finished a brief run along the path in Purgatory Park. It was a cool mid-morning in November (07). I looked up at the restroom kiosk with bulletin board, perched on a small hill. I wandered up. Old bulletin board postings described the original creation of the park and wetlands development. 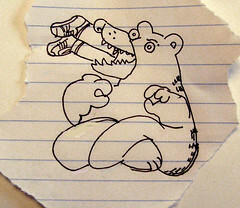 Other odd notes were posted about. I retrieved my camera to take a photo of the posted article for further reference. Next, I headed into the restroom for natural reasons. There I was confronted with a dingy, dirty public facility that conveyed other extra-curricular took place here. 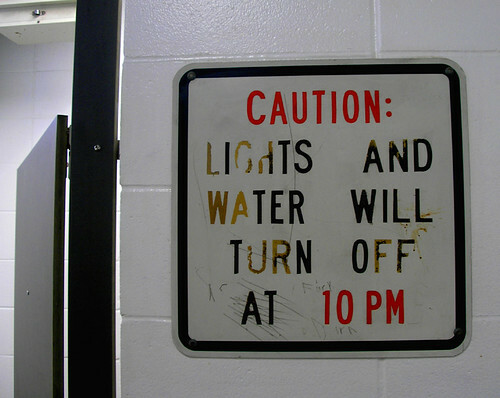 I took this photo of a sign inside. As I was in the proceess of shooting it a gentleman entered and expressed his anger with me... it seems activity here is well known. There I stood with camera in hand in this dirty restroom (Minnetonka Parks System). Purgatory is an interesting name. 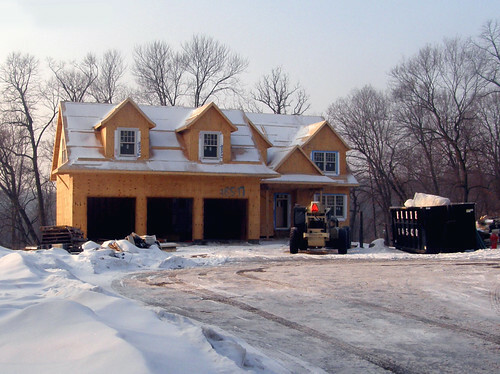 Pictured: A garage with a house attached. Current construction. The Ionic Garage Era: The "Leave It to Beaver" - a one-income, one-car household. One 50's car in the garage.Chrome bumpers. No seat belts. "Dad can I borrow the car tonight?" This garage was not attached. The Doric Garage Era: An attached garage. Two income family. Walk-out from the kitchen into the garage. The Corinthian Garage Era: 3 cars,(4 cars if you can get a variance). Strong curb appeal. House attached. Family room optional. I was raised a strict Catholic during the Latin Mass Era, so fish sticks were a given on Friday... and not an unwelcomed one. So as "low brow" as it may seem, I purchased these for lunch to satisfy some degree of cultural heritage. The 4 color package shows an inset of convenient 2-packs. - When I opened it, I find a bulk plastic bag with all 10 filets. Van De Kamp's. 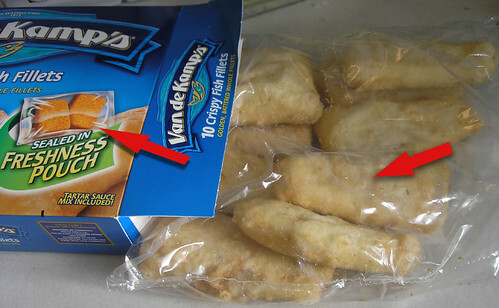 It is not a big deal, the copy "freshness pouch" gets them off the hook. Tartar sauce anyone? Saturday morning. Sunny and cold. 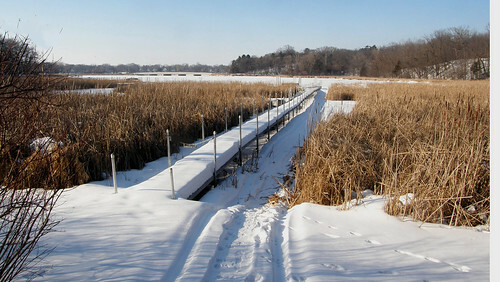 I wandered along the path that runs adjacent to Lake Susan. A low mechanical hummmmmm prevailed, along with the steady rumbling of a mechanical freshette. Open water sparkled. 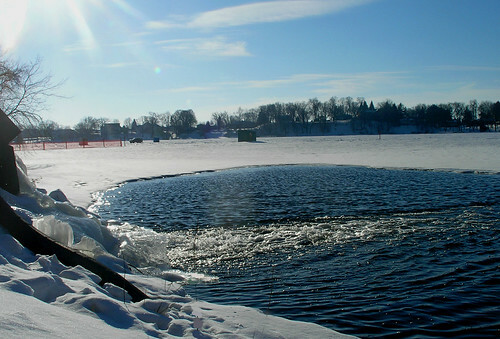 The DNR had cordoned-off a section of the water front and was "aerorating" the shallow lake to fend off fish kill. 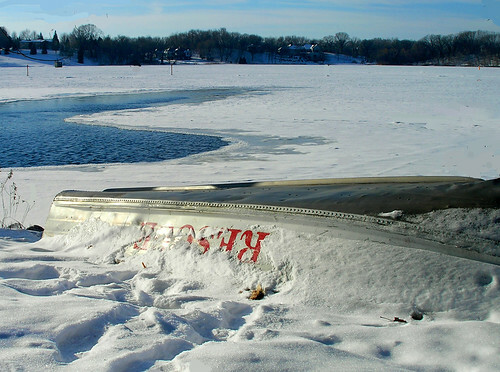 Nearby a boat labeled "Rescue" was dropped, upturned in the snow. 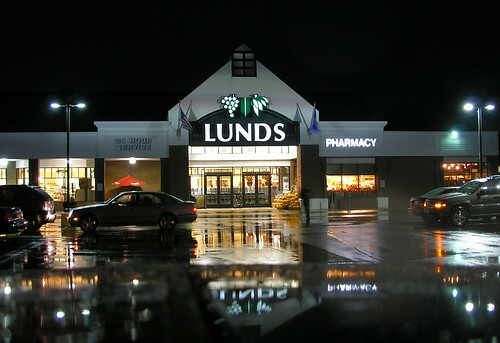 Byerly's and Lunds have eliminated 24 hour service. The last refuge of the upscale grocery-store-phobic is gone. No longer can the anxiety prone shopper stroll the isles browsing unencumbered. That's frost in the upper corner of this shot. 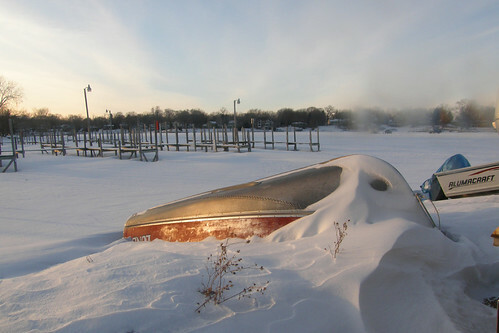 At eight below (F) with high winds, the snow is pressed up against this hibernating fishing boat. 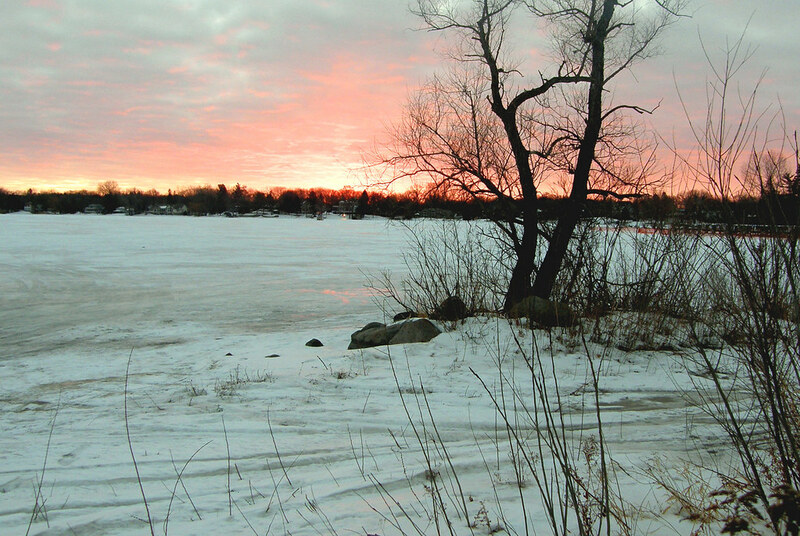 - My lens frosts over. 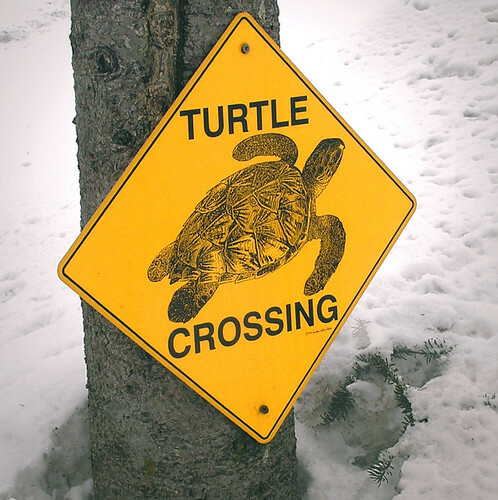 Turtle crossings are rare in the winter. I met Matt and Loren drilling a hole in the ice in Grays Bay. Perhaps they were a little overdressed, the temperature was in the mid 20s. Then again, Matt had just returned from a tour in Iraq. The temperature change alone would make one cautious. 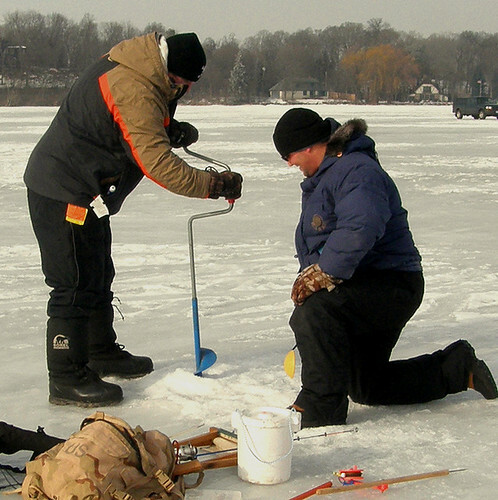 They let me take a few photos, then studiously continued to drill there initial hole in the ice. They would fish sans shack. 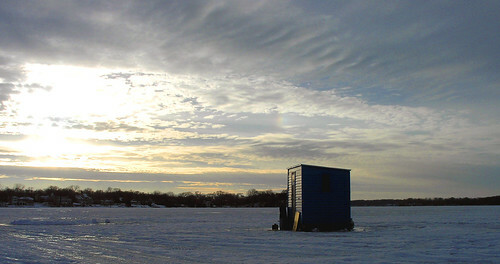 All around there were numerous ice houses with people gathering to tailgate and enjoy the evening "Superbowl" activities on the Lake.